Designed and manufactured in Italy, the new Milano 2200 AC Professional Dryer combines style, strength and power and is built to last – it's AC motor provides up to 1000 hours of drying time. If you use this dryer for 15 minutes a day you will enjoy 10 years of use making it a true investment dryer! And with 2013 hair directions mixing it up from the low pony to the neo geo cut, a good investment hair dryer has never been so important. And neither has shine! From the glistening Argan oil finishes seen at Diesel Black Gold and Donna Karan to the super polished urban blowouts of Versace to the embellished up-dos at Chanel, the shine was blinding and totally spell binding. 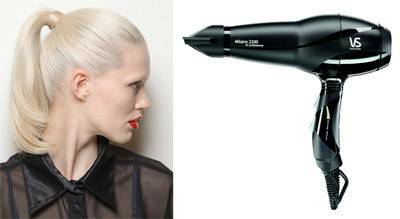 For those wanting to interpret this high shine direction, the Milano Professional AC 2200 is the perfect dryer. Developed with tourmaline ceramic technology, which reduces frizz, resulting in a smooth and shiny polished style, you can use shine as a starting point for any of the latest looks (die hard texture fans can of course use product to add a dimension to their finish – we never stand in the way of product!). A host of other features from an ultra slim nozzle and a choice of heat and speed settings also allow you to interpret all the latest hair directions quickly and easily. Ultra slim 6mm concentrator allows for easy sleek and consistent styling. Long lasting AC motor, providing up to 1000 hours of hair drying brilliance! If you use this dryer for 15 minutes a day you will enjoy 10 years of use! Extra performance with 2200 watts power. Fast, drying efficiency with an air speed of 120km/hour! Ionic conditioning technology™, which harnesses an internal ionic generator, reducing static, resulting in shiny hair every time you style! 3 heat and 2 speed settings for variable control. Cold shot to set the style. Professional salon cord length for easy styling. Available in professional black with matt scratch-proof casing and gloss accents, it looks as good as it works! Powerful, with strong heat that doesn't burn. Cuts drying time down substantially, love this dryer. RRP $99.95. Model number: VSP6614A.